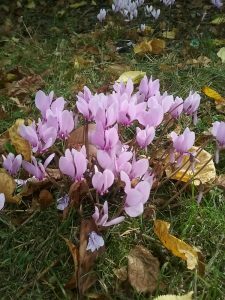 Not the indoor potted plant you give to your mum, this is the Hardy Cyclamen often planted under trees in partial shade, prefers humus rich well-drained soil. The reflexed flowers grow on individual stems and depending on variety flower from late summer to early spring, so plant a mix for continued flowering, good examples to try are purpurascens, hederifolium, and coum.Plant the tubers(corms) at the recommended depth as per variety as some planted too deep will not flower also make sure they are planted the right way up! There are a number of places to see them in flower now on campus so keep your eyes open .